Bitcoin's daily chart through the weekend is presenting yet another failed attempt to break above the long-term resistance. With the FUD across social media and cryptotwitter concerned with another Mt. Gox dump this move is not unexpected. Since clarification of the $1 billion in Bitcoin has been presented does it change the perception from traders and investors as to where the cryptocurrency will go? Bitcoin's daily RSI continues downward within the symmetrical triangle it has formed but is hanging above 50 at the time of this writing. We'll be looking for the RSI to hold near this position. Of note is the CCI which is diverging upward from the RSI. This is interesting as a divergence of the CCI from the RSI tends to lead to an upward movement from the asset in question. Decision time is coming for Bitcoin and as the direction is undetermined there are two potential possibilities that can unfold. We will present both. 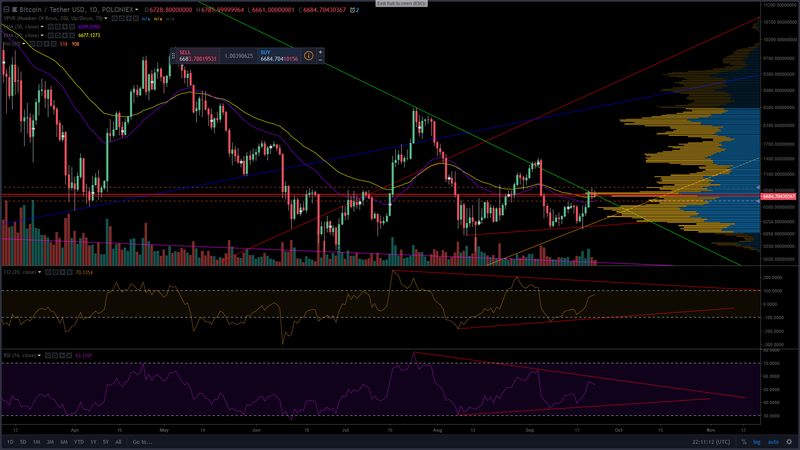 On the upside, a break above the resistance for Bitcoin is likely to lead to $7400 where the bulls will be met with a fair amount of resistance. If this level is broken the cryptocurrency is likely to push to $8000 where the bulls will need to consolidate before attempting to push Bitcoin higher. On the downside, a break would first lead to the previous support of $6200. This support has been tested three times, and can be seen as weak against a fourth push. This would likely take Bitcoin to the next level of support at $5800. With no clear direction in Bitcoin we will not take any new positions until a break either up or down has been made. That said, the indicators are currently favoring the bulls, and the answer to which way the cryptocurrency is likely to go should be had the beginning of this week.